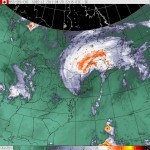 By now you have read about hurricane Irene: For a change it made landfall in the US and it’s expected to hit mainland Canada (via Quebec) later this night. Canada’s Weatheroffice has it’s expected path plotted on this page, where you can also see that they’ve started tracking hurricane Jose. Obviously, it’s tracking a more eastern path. Irene is full-up mentioned in the news, particularly by US outlets, where the lower parts of several states are under flooding watch: the main gist is that it could have been worse: the current death count stands at 19. The expectation is that the situation here in Canada will be less severe: In NB, NB Power currently reports at or around 10,000. Around here I’ve only noticed the casual strong/torrential rains. Additionally, the humidity has gone up, which is generally another sign of a tropical storm passing by. I don’t expect the power to go off, but hey, hurricanes are unpredictable: stay inside and most important of all, have a good sleep. This entry was posted in Saint John NB on August 28, 2011 by Arthur.